, known in his own time, among scholars, by the name of Florentius Volusenus, was born at Elgin, in Scotland, about the beginning of the sixteenth century, and was educated in his native place, whence he removed for academical studies to the university of Aberdeen. On quitting coHege, he went to England, where his talents recommended him to the notice of cardinal Wols^y, who made him preceptor to his nephew, whom he afterwards accompanied to Paris for education, and remained with him till the death of Wolsey, which for a | time; eclipsed his prospects. He was soon afterwards taken under the protection of the learned cardinal du Bellai, archbishop of Paris, but here again the disgrace at court of this second patron proved a severe disappointment. 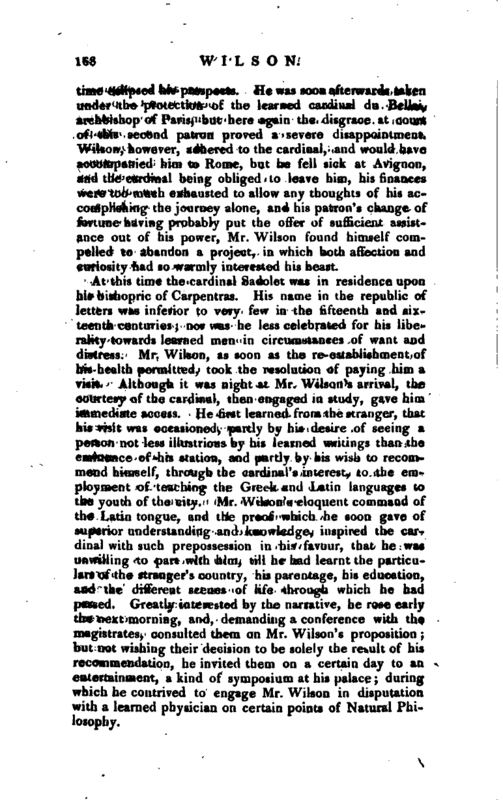 Wilson,' however, adhered to the cardinal, and would have accompanied him to Rome, but he fell sick at Avignon, and the cardinal being obliged to leave him, his finances were too much exhausted to allow any thoughts of his accomplishing the journey alone, and his patron’s change of fortune having probably put the offer of sufficient assistance out of his power, Mr. Wilson found himself compelled to abandon a project, in which both affection and curiosity had so warmly interested his heart. At this time the cardinal Sadolet was in residence upon his bishopric of Carpentras. His name in the republic of letters was inferior to very few in the fifteenth and sixteenth centuries; nor was he less celebrated for his liberality towards learned men in circumstances of want and distress. Mr. Wilson, as soon as the re-establishment of his health permitted, took the resolution of paying him a visit. Although it was night at Mr. Wilson’s arrival, the courtesy of the cardinal, then engaged in study, gave him immediate access. 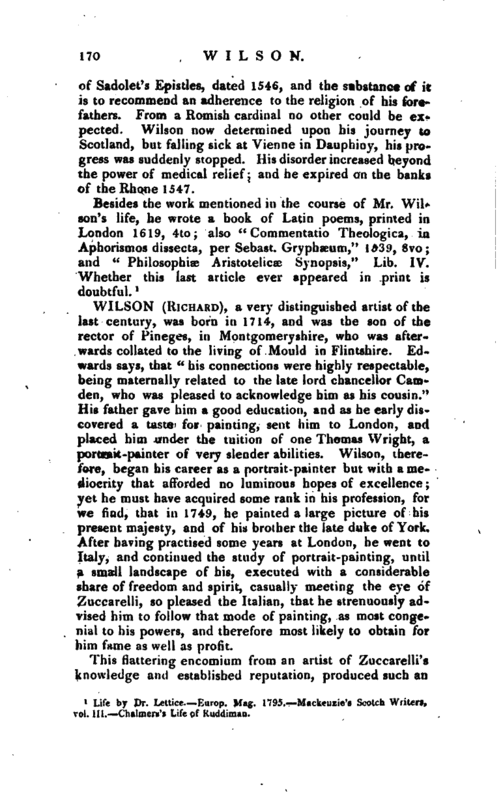 He first learned from the stranger, that his visit was occasioned, partly by his desire of seeing a person not less illustrious by his learned writings than the eminence of his station, and partly by his wish to recommend himself, through the cardinal’s interest, to the employment of teaching the Greek and Latin languages to the youth of the city. Mr. Wilson’s eloquent command of the Latin tongue, and the proof which he soon gave of superior understanding and knowledge, inspired the car-? dinal with such prepossession in his favour, that he was unwilling to part with him, till he had learnt the particulars of the stranger’s country, his parentage, his education, and the different scenes of life through which he had passed. 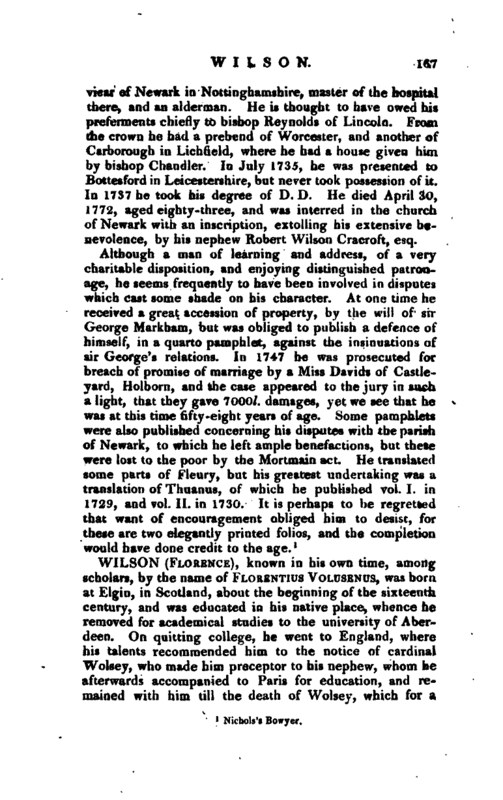 Greatly interested by the narrative, he rose early the next morning, and, demanding a conference with the magistrates, consulted them on Mr. Wilson’s proposition; but not wishing their decision to be solely the result of his recommendation, he invited them on a certain day to an entertainment, a kind of symposium at his palace; during which he contrived to engage Mr, Wilson in disputation with a learned physician on certain points of Natural Phi-. Josophjr. | It does not appear, that his learning and accomplishments ever procured him any thing better from this period than his laborious though honourable employment of teaching the ancient languages at Carpentras. It was perhaps to reconcile himself to the mediocrity of his lot, that during his residence in that city he composed his excellent book “De Tranquillitate Aninii.” If he possessed that contentment and peace of mind which made the subject of these contemplations, the first blessing of life was his, and which wealth and station only have never bestowed on man. This work is written in dialogue. The speakers are, Franciscus Michaelis, a patrician of Lucca, Demetrius, Caracalla, and the author himself. The first part of the work, and about one third of the whole, is taken up with proving, partly from the sentiments of the author, but chiefly from those of the ancient philosophers, moralists, and poets, that tranquiHity of mind is a practicable acquisition, in answer to the doubts and objections of the other interlocutors. 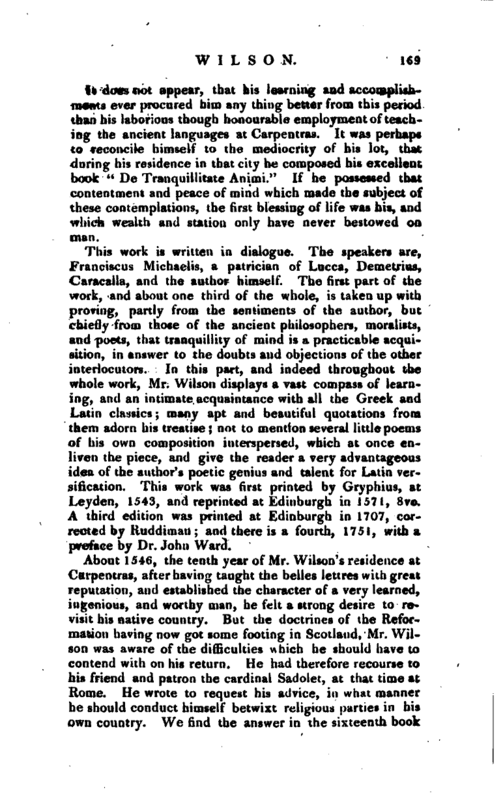 In this part, and indeed throughout the whole work, Mr. Wilson displays a vast compass of learning, and an intimate acquaintance with all the Greek and Latin classics; many apt and beautiful quotations from them adorn his treatise; not to mention several little poems of his own composition interspersed, which at once enliven the piece, and give the reader a very advantageous idea of the author’s poetic genius and talent for Latin versification. This work was first printed by Gryphius, at Leyden, 1543, and reprinted at Edinburgh in 1571, 8vo. A third edition was printed at Edinburgh in 1707, corrected by Kuddiman; and there is a fourth, 1751, with a preface by Dr. John Ware!. About 1546, the tenth year of Mr. Wilson’s residence at Carpentras, after having taught the belles lettres with great reputation, and established the character of a very learned, ingenious, and worthy man, he felt a strong desire to revisit his native country. But the doctrines of the Reformation having now got some footing in Scotland, Mr. Wilson was aware of the difficulties which he should have to contend with on his return. He had therefore recourse to his friend and patron the cardinal Sadolet, at that time at Rome. He wrote to request his advice, in. what manner he should conduct himself betwixt religious parties in his own country. We find the answer in the sixteenth book | of Sadolet’s Epistles, dated 1546, and the substance of ifc is to recommend an adherence to the religion of his forefathers. From a Romish cardinal no other could be expected. Wilson now determined upon his journey to Scotland, but falling sick at Vienne in Dauphiny, his progress was suddenly stopped. His disorder increased beyond the power of medical relief; and he expired on the banks ef the Rhone 1547. 1 Life by Dr. Lettice Europ. Mag. 1795. Mackenzie’s Scotch Writers, vol. III. Chalmers’s Life of Ruddiman.